According to Malaysian Chinese press Sin Chew Daily, the Lesbian, Gay, Bisexual and Transsexual (LGBT)’s Guidelines were distributed to all the attendants at a forum in Penang, which was organized by Yayasan Guru Malaysia Berhad (YGMB) and Putrajaya Consultative Council of Parents and Teachers Associations. Personally, I have no ideas about what are the 'Scientific Statics' or ‘Psychologically Measurements’ that really support the above stated symptoms. 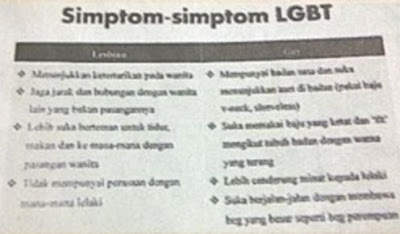 But I do have lot of questions to ask the person or the team that concluded the above stated symptoms of Gay and Lesbian. When you say a male is attracted to other males or a female is attracted to other females, I would just simply refer to the celebrities’ life in any region on this globe. If a male celebrity posing no attraction to other males or if a female celebrity has no ability to attract other females, yet they are not really successful in their career. When you talk about muscular body, erm… I think all of the gym centers and popular body builders would definitely reject this assumption. And a V-neck shirt is just common for anyone to try with, unless you are still living in 18th century, who is totally outdated when come to the term of ‘Style’. As for Sleeveless cloths, it fit many of us who just can’t stand with the hot sunny day. As for female that like to hangout, have meals or sleep in the company of other females, I bet you will be surprised with the huge figures of number, if you really have them all recorded. So, are they all having the lesbian’s behaviors? I will just give you a big smile, if you are giving me a ‘Yes’ to this question. What else could I comment on this Malaysia LGBT’s Guidelines or Points of Awareness? Erm.. I think those who produce these, do not really help in dealing with the LGBT’s issue, but only give a huge smile to you and me! Look! How happily they are in TYT Network, when discussing on this Malaysia LGBT’s Guidelines. Once again, making Malaysia popular!